Hi guys i dont post but i just wanted to say i have been betting in perth for alot of years and yes u have to take good with bad.But i had a good eachway bet on forceful and when they were betting almost 6 on betfair at alot of the stages in betting well i let u be the judge.This horse ran good sectionals last start looked ok in yard was on the up from a good gate.YET SOMEONE WANTS TO GIVE U WELL ABOVE MARKET.I have to say i have lost interest and with whats happened in melb this week and things like this happen to much for mine i rather go spend time with my kids i feel cheated to be frank.Best of luck to all i am done. Someone always has an opinion different to ours. I worked around Forceful due the the rise in weight (3kg). It still ran a terrific sectional today, just one pair too far back and when they eased mid race, it enabled the leaders to get a breather. The ones that finished it front of it are no slouches and have been in good form. Enjoy the extra time with the kids. Backyard cricket was our fav pastime. GaryH, goose likes this post. I know exactly what you mean. I've been betting with Betfair for along time, and it's not easy. What I have learned, is that impatience will kill you, and a preconceived idea will do the same. And I suffer from both!! You have done the form, on weights facts and figures you think what you have selected is a great bet. You would be very happy to cop $5.00, thinking it's great value. On Wednesday when some prices first go up, it 3.50. By Friday it's out to 4.40 because when the Corps and Tab open their markets they are betting to 140% plus. Saturday morning it's steady and it opens at 4.40 in the "ring" which is now the odds offered by all the Corps. It gets out to $5.00 on the Fair, with about 15 minutes to go, and in you go. You are on, and look at that, it's in to 4.60, 4.20 3.80 3.60 in the "ring",and aren't we happy with ourselves. Horse looks great in the mounting yard. Trainer is interviewed. "yes, it will run a big race and be very hard to beat", he says, and aren't you feeling great. Then with about 2 minutes or even less to go, someone wants to lay it to lose 4,000 at 4.40. Hang on, you think, it's still 3.60 on the official prices. But it doesn't end there. "They", whoever, the mystery "they" are, are now hawking it. You can have 2,000 on at 4.80, 1,500 at 5.00, 2500 at 5.40, and so on, until they jump and it actually SP's at 6.80 on the Fair. And you sit there and think what the F has happened? It is still $3.60 on the official prices. It runs a reasonable race, but you know you are gone 150 from home. If you could, you would throw a brick at the TV. How the F do "they" know? How the F can a horse which is $3.60 in the ring, and going to pay 3.70 on the goat, get to 6.80 on the Fair? How in heavens name can the Stewards in ALL states, keep ignoring this cr@p, which is going on every day at every race meeting all around Australia. It is unbelievable the cr@p that we punters who are acting honestly, have to deal with. We know it's a tough caper. We know that you can count the long term, that's 30 plus years of blokes who have lasted on the punt on the fingers of one hand. But all we want is for the Stewards to earn their hundred grand a year and investigate this cr@p which stands out like dogs gonads. And on the very rare occasion that they do, you know what they say, the horse was layed by general punters, or some such stuff. Apparently, they don't know how the smarties operate, and have never heard of the term bowlers. The only way to at least have some chance of combating it, is to just wait and if you have to, then cop the 4.20, even though you could have got 5.00. At least you know you are probably on a trier. By the way mate, it can work the other way as well. With a minute to go, if "they" are taking say 8.00 a horse and it's 12.00 on the official prices, even if you have already backed your fancy, and give what "they" are backing at the unders no chance, have something on it. It will either win, or go extremely close. Bottom line, I watch for all this stuff, and still find it extremely difficult to win. But as my old man used to say, its a disease curable by death only. Hi all thanks for the feed back i am not saying its wrong thats racing and u have to take good with bad with bad.But i am pretty shore that horse ran the quickest last 200m of the meeting last start off a fair overall time.And was 3rd up today with a rcord of 5 wins from 10 starts if i recall.I dont know about u but u are not a bad animal with a win record like that.Given it beat one of the horses in race last start.One in market was first uo and the other is a ok animal.Getting 6 dollars on betfair with top jockey up.Well they are to smart for me.Thanks again for the thoughts i wish u all well on punt.But i have to say and i never thought i say it i have lost interest.Best wishes. I could say the same for Chix Pic.....struggled to beat its stablemates with a world perfect run. When you said, WITP "they are too smart for me", that's exactly the point. And not just you, but me and 99% of the punters out there. That's why when the Stewards come back after their one in a thousand investigation, and say the horse in question was layed by general punters, you know its bull. I don't know any general punter prepared to give you double the odds for big money in the last few minutes of betting, on a horse which has apparently shortened in the ring. You need to know that the horse can't win in order to do it with confidence. @Whatisthepoint I'm triggered by the fact that not once did you use the spacebar after a full stop. Thats true also i cant disagree lol cheers. Bookielover a few questions - how big is Betfair and do all big punters and individual bookmakers use it ? Out of curiosity would it be possible for Tabcorp to run something similar ? Is it for the serious punter the "only way to bet" and is it user friendly? What for the average punter are the advantages and disadvantages? Also the origins of Betfair - who's brainchild was it again ? How did it begin ? I always thought there was room for an industry run betting exchange. Betfair was started mainly by a bloke in England called Andrew Black in 2000. I think they moved most of their operation out of London to Gibraltar for taxation reasons. They were registered on the Stock Market in England. In 2016, they merged with big Corporate bookie Paddy Power. They operate in a heap of countries over the world, So when you back a horse on betfair at say 22.00, the person giving you those odds, might live in Italy. It's possible but would be seen as totally unethical for Tabcorp to run one. Tabcorp is set up as a parimutuel, i.e. totalizator operation. They then decided to add fixed odds to their service and operate as bookmaker as well. I can imagine that it would be seen as a total conflict of interest for, on the one hand, getting Dave Stanley on Sky asking you to back a horse, and then in the next second, urging you to lay it if you don't like it. As much as I love the on course bookmaker scene, if I'm going to be totally intellectually honest, it is the only way to bet for EVERY punter. You have the opportunity to back a horse you like to win, and bet against it if you think it can't win. And every on course bookmaker in Australia, is using Betfair. It is exceptionally user friendly. Of course if you are a multi bettor, Quinellas, trifectas quadies doubles etc, then it's the tote or the Corps who also provide all up betting. I can't see any disadvantage using Betfair for any punter. The advantages are numerous. As I stated above, you can watch backing, and laying trends. I don't know how much you understand about percentages, but I'll try to simplify it. Bookies, that's Corps and on course, are probably getting down to about 116% on average with their markets. In the case of on course bookmakers, It used to be much lower. In fact in Sydney, their ring would get down to 102% sometimes a percent lower. But Corps have got the young market, I'm talking about the 20-40 year olds, by the short and curly's, and the on track bookies aren't going to bet to a lower percentage, than what the Corps are giving. The young ones who go to the track, generally ignore the bookies there, and you can hear them as they loudly speak on their mobile's giving their account number to the Corporate Bookie with whom they bet. Mind you, if you went to the track at Albany today and bet with the bookies there, according to the best bookies site the percentage on race 9 was 160%. You have to be a complete imbecile to bet into a market with that percentage. I have calculated the percentage on numerous races on Betfair, and I have seen, based on the best price bet during the course of the betting on the race, percentages on Betfair getting down to as low as 78%. That means that if you were very smart and invested $100 backing every runner, no matter which horse won, you would have to win 22.00 on the race. Others use Betfair to arbitrage. Essentially the punter believing, or knowing, that a horse is going to backed, backs the horse on Betfair at the 8.00 and when it is backed down to say 5.00, then lays it at the 5.00, so that he shows a profit whether the horse wins or loses. Conversely, a horse may be 2.50, and you reckon it will get out in the market, so you lay it to lose at that price, then when it gets out to 3.50, you back it. 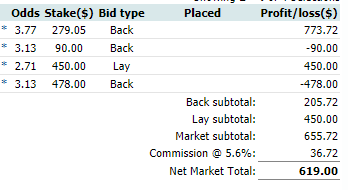 I'm not that smart, nor am I that confident, nor do I have information that would give me the confidence to do it, but I do have a mate of mine who does his own form and markets, and does very well out of arbitraging. Bottom line is this, for value alone, any punter who is not using Betfair, is costing themselves money. I'll give you an example that I easily recall which happened 7 years ago to me. I was in my room where I'm on Betfair and watching the races, when my missus walks in to get something. She's loves going to the track taking her trifecta's etc but other than that, she's not a punter. She's looking at the horses behind the barriers, this is at Gawler in South Australia where the track is a heavy 125, an absolute bog, and sees a horse and the jockey that is in all green colours. Her favourite colour is green. She says have you backed that green horse. I said no, I've backed number 6 and number 10. You should back the green horse, she says and walks out. I look at its odds it is 51.00 in the ring, and 320.00 on Betfair. And I think to myself, no way I'm backing it. The last horse goes into the barriers and I say to myself, F it. If she's right, I'll never hear the end of it and throw $20.00 on it. It tails out last in the first 600 over a 1600 metre journey, and I'm thinking what an Fwit I am listening to the missus and knocking off the 20.00. By the time they get to the 400 metre mark it's caught the field. Jockey pulls it to the outside, it swamps them over the last 100 and wins eased up by 3 lengths. If you held a gun to my head, I couldn't remember it's name. I can't remember what I backed yesterday let alone 7 years ago. What I DO remember. however, was having to sling the missus half. How did she find out? I screamed like a lunatic when it won, and she ran to the room thinking I was having a heart attack. Now, Riders, that was my very long winded way, of pointing out to you that a 51.00 chance in the ring which, by the way, paid around 86.00 on the tote which I can recall, because I was congratulating myself for being so smart and backing it. Of course the bloke on Sky was full of himself telling everyone how good the tote odds were compared to the ring price, and it's paid has paid 320.00 on Betfair. I would have got a grand backing it with bookies, and 1720 with the tote. After paying a 6% commission on the winning bet I got just over 5900. I'd lost a few bucks on my two selections. This was more than three times the tote odds. Yes, you do get charged a commission on winning bets, but not when you lay a horse to lose and it loses. But if you are a constant user of Betfair, you get discounts on the commission you pay. As I said in a previous post. It's almost impossible to win on the punt, but the value available on Betfair, is impossible for anyone who at least wants a better chance of winning, to ignore, and you do yourself, but more importantly your pocket, a great disservice if you don't have an account with them. detonator, Ridersonthestorm33, Manchild likes this post. Forceful I think you are reading too much into it was paying 5.10 on tote 4.80 fixed looked like it was sweating up prior maybe in mounting yard? if you were there on course seen it sweating up and the pattern of racing goes up 3kgs and against better field. You think stuff it this cant win and just want to lay it but nervous as hell with Pike on board not for me but some may do it. RightOakAunt, Gilgamesh likes this post. Yes, you do get charged a commission on winning bets, but not when you lay a horse to lose and it loses. Good post mate but I think you are wrong on this point. They charge a commission on the profit you make on a race market. It doesn't matter how you make the profit. Backing a winner or laying a loser, it's all the same to them. therealkramer, H-BOMBER likes this post. Guess though the clip is better than the k.o the tab and others give % wise. Been pretty lucky on betfair i must say, it can be ultra frustraighting too, accessing it on phone sometimes isnt easy when the prices change. And its not great to use if u want to put bets on and leave to resume your day, you must go right until just before jump to get the best price in most cases. I haven't laid a horse in years. When they raised their commission rate as a result of extra imposed taxes by the racing authorities, I called my "consultant' at Betfair to have a chat about it. Why did I have someone that I could call at Betfair directly on his mobile without having to navigate calling the Betfair number? Well may you ask, if indeed you have. I was a pretty heavy betting client with Betfair for a few years, after they first started in Australia, and was elevated to Premium Client level. One day I get a call from a nice bloke from Betfair, informing me that he was appointed by Betfair to look after a number of PC's and I was one of them. If I ever needed anything, or I had an issue, all I need do was to call him directly and he would answer all my queries. So I called about the raised commission levels and he explained that it was out of their hands. That's when he said to me, you can avoid paying commission if you lay a horse to lose and it loses. You don't pay the comm on your lay bets when the horse you laid to lose loses. That would have been at least 6 years ago that I was told that, and in that time, I have never laid a horse to lose because I reckon all the value on Betfair is on the backing side rather than the laying side. Maybe what my bloke told me applied at the time, but has changed since then. Are you speaking from the personal experience of having laid horses, Rodent? If so, then you'll get no argument from me. As an aside, they really did try and look after their Premium Clients, and probably still do. I was offered an all expenses 10 day holiday for me and the missus to go to the Hong Kong Mile or whatever it's called, one December about 6-7 years ago.Business class travel for both, 5 star accommodation, limo to the track, reserved seats etc etc. had to knock it back because of the wife's health. Para, I'm often caught out like you. The best way that you can get around it in my opinion is as follows. Let's say you like Avilius at Caulfield. It's being quoted generally at 2.70. You look at the Betfair market early in the day, and not much has been traded because it's in a race that's on later in the day. What I would do under such circumstances, and have done, is work out in my mind what price I think is a fair price for me to accept. The price I come up with might be $3.20. So I ask for $3.20. Of course I'm not going to get that at the point that i ask for it, and I have to go out for the rest of the day. The bet comes up in your bets column on the right hand side, and you will see that you have an option to "tick a small circle" that says that you will accept the Betfair SP price when they jump, if you have not been successful getting the $3.20. It's not a perfect solution, but at least you know that no matter what happens, you are on Avilius, and when it wins and you get home and look at the price you got, perhaps you got the 3,20 you asked for, or it only paid 2.50 SP because it was very heavily backed. The main thing is, you didn't miss out on backing a winner. What sort of turnover were you punting to get offered the holiday? Do you have to pay premium charges? I stopped using betfair when they started charging me premium charges. Years later they relented and offered me a deal whereby I didn't have to pay premium charges but instead had to pay the full commission with no discount. I didn't bother returning. My wife is the one in the family who uses Betfair as now that their commission is much higher than in years gone by, she doesn't attract the premium charge yet still gets a discount. Below are her bets on the 2yo Magic Millions at Pinjarra. As you can see, she pays a commission on her successful lay bet. Victoria's double header Wednesdays continue tomorrow with Stony Creek during the day into Sandown twilight racing. Get even more value with this exclusive offer worth up to $200. Opt in via the yellow button below by 11:00am Wednesday (13th February 2019) and if your combined market winnings (before commission) on Stony Creek thoroughbreds during the day on Wednesday (13th February 2019) is more than $200, we will give you a 30% winnings boost on any winning markets at Sandown's twilight race meeting (13th February 2019), up to $200 in total. Terms and conditions apply here. How does the 30% winnings boost work? For every market you make a profit on at Sandown, you earn a 30% boost (up to $200 in total for the race meeting). All eligible customers' boosts will be credited within 24 hours of the Sandown meeting.